The Fellowship was fortunate enough to obtain a copy of BROKEN WORLD #1 from BOOM! Studios. Frank J. Barbiere writes, Christopher Peterson draws and Marissa Louise colors. The asteroid is coming, to collide with Earth and wipe out all life. Elena is planning to be on the last transport with her family, but she’s got a past to outrun first. One fake passport later and she’s on her way to the elevator, but she gets delayed and the transport leaves without her. What happens next is an epic-level twist in the plot, to say the least. Elena seems likeable enough – she loves her family and she loves her teaching job. But she seems pretty haunted by something in her past, something she’s obviously not proud of. The government isn’t too thrilled about it, either. The aforementioned twist should give us plenty of opportunity to learn about it, too. The art is really nice, with cool action effects, and I really like the moody colors. This issue is a great example of teasing the reader; there’s a ton of stuff under the surface, and we’re allowed to see only that it’s there. To learn more, well, you’re just going to have pick up the book. 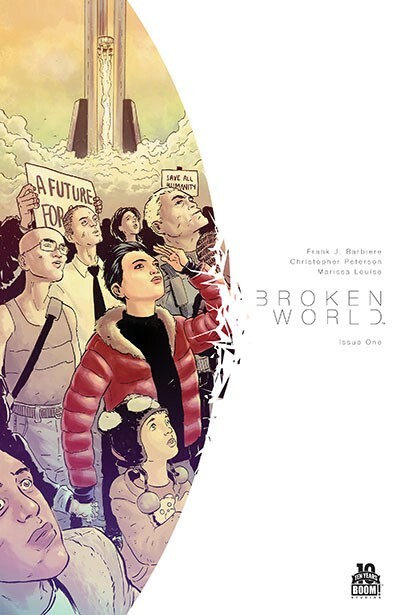 BROKEN WORLD #1 is available now at your FLCS or at boom-studios.com.